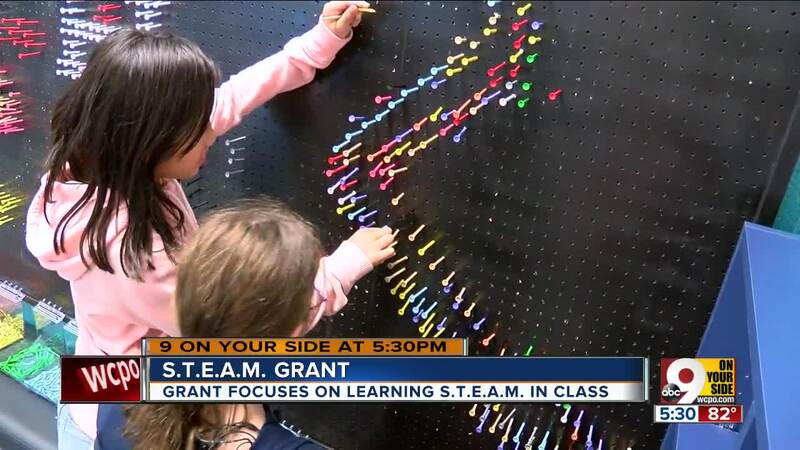 INDIAN HILL, Ohio -- A new Indian Hill Elementary School classroom has some new technology to introduce students to science, technology, engineering, arts and math (STEAM) as early as they can. This year, the kids are taking classes in the school's new iLab. It’s a classroom where students are encouraged to use the technology on hand to complete their schoolwork. “We have iPads and iPhones for doing projects, over here we’ve got our pegboard,” Sheanshang said. The STEAM iLab features include a graphic design station, Lego wall, pegboard wall, drafting tables, consumable materials, robotics, 3D printers and pens, virtual reality (VR) goggles, tools, flexible seating, mobile furniture, Cricut cutter, Poster Maker, Makey Makey, and Little Bits circuitry kits. The complete STEAM iLab was finished this past summer, and the 2018-2019 students are the first to reap the benefits. “It’s important to start from a young age to give students the experience of really the engineering aspect and the ability to know there’s a problem and try to find a way to solve the problem,” O'Brien said. The iLab was made possible by a $70,000 donation from the Koch Foundation. Dorothy Koch worked as a teacher at the Indian Hill School District, her four children and four of her grandchildren are all Indian Hill graduates.